Brandyn Heppard usually arrives 30 minutes early for his visits to Northern State Prison in Newark, N.J. He puts his pre-approved belongings in a clear plastic bag made on-site and signs his name in the visitor logbook. Then, he walks through the first of a few metal detectors, and stands still to have a wand waved across his body and to be patted down. Heppard is escorted through five locked or guarded doors and gates before arriving to the bare, windowless classroom where he teaches philosophy courses as part of the New Jersey Scholarship and Transformative Education in Prisons Consortium (NJ-STEP). 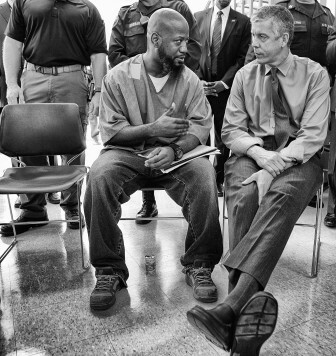 This summer, the Department of Education announced an experimental Second Chance Pell Pilot program to examine how such prison education programs could be continued and expanded. It marks the first time in 20 years that qualified students will have access to Pell grants while in prison. 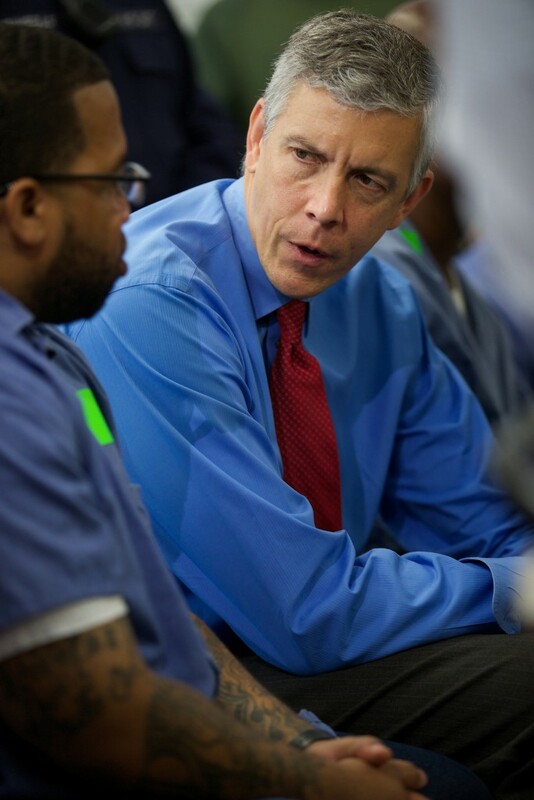 Last week, Secretary of Education Arne Duncan invited Heppard and other corrections educators, as well as Department of Corrections administrators, to his office for a roundtable on the ins-and-outs of their work. The meeting served as a primer for Secretary Duncan’s team in preparation for the pilot application process. Most prisons offer some educational options, which they fully fund. College courses, however, are only available through correspondence or partnerships with universities, and come at a cost to the incarcerated students and their families. But those on the ground say funding is just the tip of the iceberg when it comes to educating the nation’s roughly 1.5 million adults in state and federal prisons. Blacks made up 37 percent of the males incarcerated in state and federal institutions; at 22 percent, Black females trailed White women (49 percent), but are incarcerated at twice the rate of White women, according to the Bureau of Justice Statistics at the Justice Department. “[Prison education] can become a very political issue. It’s definitely an issue of equity, but often once you bring in the criminal justice aspect of it, a lot of people start to say, well, do inmates deserve this? The equity question gets lost,” said Heppard, who is tenured at Raritan Valley Community College in New Jersey. During the meeting with Duncan and in interviews with the NNPA News Service, educators repeatedly mentioned that skepticism, in both corrections and academia, were a major challenge. He and the other educators shared a litany of challenges at the meeting. For starters, operations vary between facilities. Inmates receive scheduled computer access for typing assignments, irregular access, or no access to technology at all, depending on where they are housed. There’s also the issue of inadequate time and space to work with students, and unreliable attendance, with students often being pulled out of class or otherwise restricted. Chief among these issues though, is the difficulty of keeping track of students as they move through their time and eventual release. Still, there are proven socioeconomic benefits in educating incarcerated Americans. It costs an average of $28,893.40 to keep one person in a federal facility for a year, and a comparable amount in state facilities, according to the Bureau of Justice Statistics. But a 2013 study of New York prison education programs, which appeared in the Journal of Criminal Justice, found that formerly-incarcerated people who did not take classes while in prison were almost four times more likely to be re-arrested than those who did. Bianca van Heydoorn has worked with incarcerated people for 14 years, and was present at Secretary Duncan’s meeting. She is director of educational initiatives for the Prisoner Reentry Institute at John Jay College of Criminal Justice in New York City. Despite these benefits, prison college education programs took a major hit in 1994 when Congress disqualified otherwise eligible students from using these funds while incarcerated. “Prior to 1994, there were almost 400 college programs in prisons nationwide, and within the span of one year, dropped to eight when Pell [grants] was eliminated,” said Baz Dreisinger, one of van Heydoorn’s colleagues who teaches intro English courses in New York prisons. Dreisinger also serves as the academic director of the Prison to College Pipeline at John Jay College. The possible reinstatement of Pell grants for incarcerated students is part of the Obama administration’s attempt to address the damage of mass incarceration. Programs will apply to join the pilot program; the incarcerated students enrolled in the chosen programs will be allowed to apply for Pell grants for tuition, fees, books, and supplies. The pilot will run for the 2016-2017 school year. The educators didn’t seem to be worried about whether the pilot would have positive, measurable results. “The pilot program…is a really good way to get the ball rolling…it was a ball that never should’ve stopped,” van Heydoorn said. Dreisinger added that such steps would benefit the nation at large. “The people in prison are coming home to communities. Do we want them educated and being the best human beings they can be, and having the best opportunities, or not? It directly affects all of us in that way,” she said. Thanks to NNPA for sharing this story with us. Connect with Jazelle Hunt on Twitter at @JazelleAH.